A new paper published in The Cryosphere from UTIG and international researchers is helping identify a new location for ice core drilling in East Antarctica, all part of ICECAP/IDEA (International Collaborative Exploration of the Cryosphere through Airborne Profiling/Ice Divides of East Antarctica), an international collaboration with Australian, French, British, and Chinese colleagues to understand the region. A Basler DC-3T plane used to survey Antarctica. Photo courtesy of Duncan Young. Ice sheet divides are areas where ice flow switches from going from one ice sheet catchment to another, creating lines where ice flow goes to zero. These areas provide an opportunity to preserve old ice that contains a record of how greenhouse gases operated throughout Earth’s history, particularly when our climate behaved differently than today. UTIG Research Associate Duncan Young led the new research with help from graduate students Enrica Quartini and Marie Cavitte, and senior research scientist Don Blankenship. 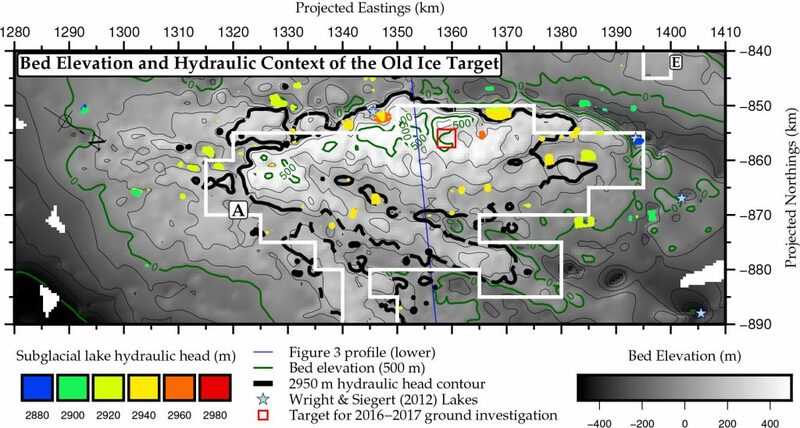 They used a combination of old and new radar data to learn more about the area, known as little Dome C, that has been identified as a potential area to drill a deep ice core. Previously, another ice core was drilled in the region, known as EPICA-DC, but it only captures a climate record going back 800,000 years and researchers hope to learn more about how the Earth’s climate and greenhouse gases behaved before then, when ice ages cycled more quickly. To gather the data, Young, Quartini, UTIG radar engineer Gregory Ng, and Australian and French scientists set out to the high altitude Concordia Station in East Antarctica in January 2016 for six days to collect new high-resolution data by aircraft, as part of a two month field campaign. 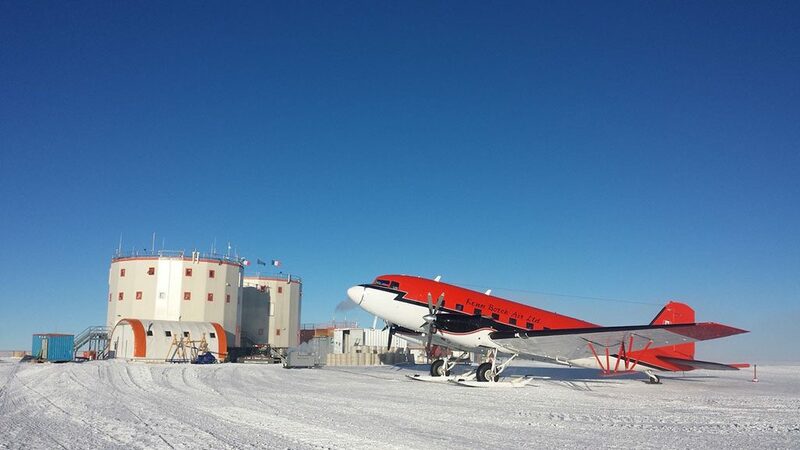 They used a Basler DC-3T supplied by the Australian Antarctic Division, a hardy WWII twin-propeller cargo plane that has been modernized with improved engines and electronics by Wisconsin company Basler Turbo Conversion, to conduct an aerogeophysical survey. Fuel and accommodation was supplied by the Italian Antarctica program (PNRA) and the French Antarctica program (IPEV). The data they collected was quickly processed and presented at the International Partnerships in Ice Core Sciences (IPICS) Second Open Science Conference in Hobart in March 2016 and have now published in The Cryosphere. The region contains many subglacial lakes in narrow valleys and mountains, which will make drilling tricky. The most promising drill areas are on mountains; however, this makes the the terrain rough. They were able to identify an area in little Dome C that shows great promise, but more surveys will be conducted to pinpoint exact drilling locations as multiple ice cores will need to be drilled to fully interpret the greenhouse gas records. Follow on papers are in review in The Cryosphere that build on this research, including the use of radar horizons and snow strata in the distance as markers of time. This figure shows the potential site with a compilation bed elevation with imaged subglacial lakes superposed. The target region for further ground work lies near the highest point on the bed, northeast of the ice divide. “Using the industry seismic analysis software Landmark Decision Space Desktop, we extracted the internal layer information, and working with scientists from France’s Institut des Géosciences de l’ Environnement (IGE) in Grenoble, we have been able to model the predicted age of the ice near the bed, and predicted that the age of the ice indeed spanned the time interval of interest,” Young said. UTIG has ongoing research in Antarctica, including SPICECAP with partners in China, Australia and France and the US, that is looking into ice flow and the rock bed on nearby Titan Dome.